Finally the D-Day arrived. The aircraft is ready and so also the missile. India is all set to conduct the first trial of supersonic cruise missile BrahMos from Sukhoi-30 MKI on Wednesday. BHUBANESWAR: Finally the D-Day arrived. The aircraft is ready and so also the missile. India is all set to conduct the first trial of supersonic cruise missile BrahMos from Sukhoi-30 MKI on Wednesday. 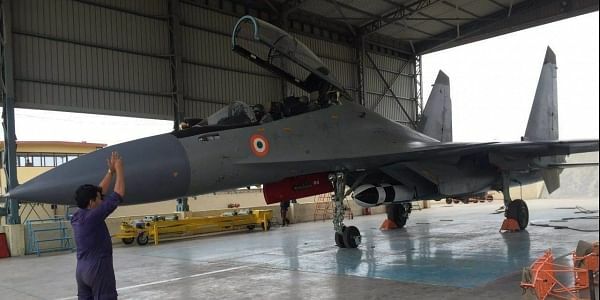 Defence sources said the aircraft will take off from an air force base in West Bengal and fire the missile against a target over the Bay of Bengal. Preparation has been completed for the maiden trial. Initially, though it was planned in 2015, the test was deferred due to delay in integration with the aircraft. "The launch window is 10 am to 12 noon. Two aircraft have been kept ready. While one has been integrated with the missile another will track all along its flight - from fire to hit. We all are excited for the mission," said a defence official from New Delhi. Jointly developed by India and Russia, the air force version of 8.4-meter BrahMos missile, fastest in the world, has a strike range of 290 km and carries a conventional warhead up to 300 kg. With high-precision, it has devastating power at a supersonic speed of Mach 2.8. Defence sources said the BrahMos Aerospace had to reduce the weight of the missile as it is to be launched from a moving platform unlike its army and navy versions. Some modifications have also been made in its design to easily integrate it in Sukhoi aircraft. Though the air-version of the missile is yet to be tested, several countries had evinced interest in the weapon system during the recently concluded Dubai air show. Earlier, it had demonstrated successful integration with the aircraft. If test fired successfully, BrahMos will be first weapon system in the world to have such capability. As of now, there is no such weapon available which can be fired from land, sea and air platforms.